Stop the execution of Jeff Wood!!! Everyone can call the Governor and leave a message (They keep count) Main Switchboard: (512) 463-2000. Example: “I’m calling to ask the governor to grant clemency to Jeff Wood.” You can give your reasons and tell them your name and where you are calling from. Daily Kos has created a form for people to sign and send an email to the Texas Board of Pardons and Paroles to grant clemency for Jeff Wood. They have written a letter already, so you can either send the letter they have written, or they allow you to edit the text and write your own letter before you send it. Spread the link to savejeffwood.com on your social media accounts, like facebook and twitter, hashtags #savejeffwood #jeffwood. Share links to any media stories you see to your contacts on your Facebook or Twitter pages. 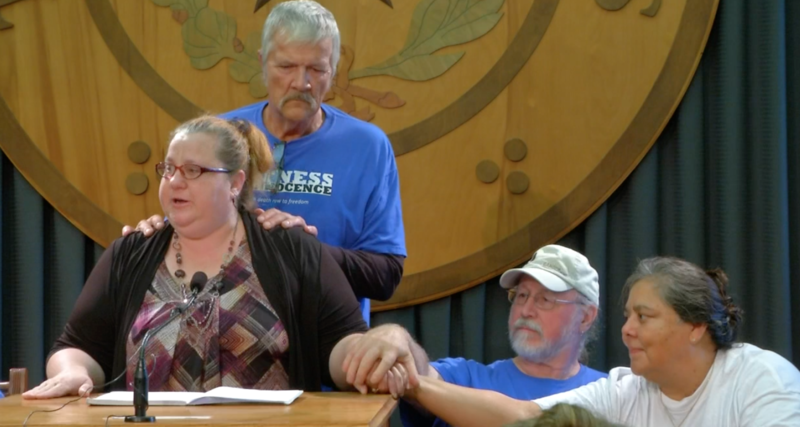 It took over 17,000 contacts to Governor Perry and the Board of Pardons and Paroles (via the aforementioned means of communication) to make a difference for Kenneth Foster (In addition to the agencies that got involved). Below are some sample letters you can use for ideas. Please write your own personal letter and mail/fax in. (Certified mail is best but all forms of communication are welcomed!) Please mail 1 letter per person...not per household; a man's life is at stake who did not kill anyone and we need as many as we can get! Again, emails, petitions, form-letters, phone calls, postcards and personal letters are but a few great ways to contact these government officials about Jeff's case, however the most effective form of communication is a well written personal letter. Personal letters will be put into a permanent file whereas emails, form letters, and petitions may be discarded. Please let your “VOICE” be heard! It only takes a few minutes to pen down your thoughts/ideas and to get them sent out to your government officials. When writing to your government officials, remember to always be courteous and precise. Do not remind them that your tax dollars pay their salary and do not be threatening in anyway! Remember also that LONG letters might not be read as thoroughly as you want them to be so, keep to the points. I am writing to urge the Board to recommend death row prisoner Jeffrey Lee Wood be granted a commutation and removed from death row. Further, we hope that Governor Abbott would act favorably on such a recommendation. As we are certain you are aware, Mr. Wood is scheduled to be executed on August 24, 2016. Mr. Wood was convicted of capital murder under the Texas Law of Parties. It appears evident that he neither killed, nor anticipated that Daniel Earl Reneau would kill Kriss Keeran. He did not anticipate that a murder would occur and was not in the store when the murder took place. The shooter, Danny Reneau, has already been executed for this crime. When asked on death row to identify the shooter, Reneau had a one-word reply, “Me.” This case is similar to the case of Kenneth Foster, whose death sentence under the Law of Parties was commuted by Governor Perry in 2007. Further, there were several errors made at Jeff's trial, and as a direct result of these errors and prosecutorial misconduct Jeff did not receive the fair trial he was entitled to. Jeff also has mental and learning disabilities, dating back to his childhood, that allowed him to be taken advantage of not only by the shooter, but by the prosecution in this case as well. The jury never heard the mitigating evidence that was readily available. This oversight regarding mitigating evidence has not been corrected by the courts - and executive clemency exists to intervene where the courts have not. Therefore, we implore you to demonstrate your respect for justice and human life by doing everything in your power to commute the death sentence of Jeffrey Wood. I thank you for your time and attention to this very serious matter. In the interest of justice, I appeal to you to grant clemency for Jeffrey Wood, who is currently scheduled to be executed on August 24, 2016. He was sentenced to death, through the Law of Parties, in 1996 for the murder of Kriss Keeran. This Murder was actually committed in 1996 by Daniel Earl Reneau who was executed in Texas on June 13, 2002. I am particularly concerned that Jeffrey Wood may be executed despite serious concerns regarding inadequate legal counsel and lack of mitigating evidence presented during his trial. The death of Kriss Keeran was extremely tragic, and I in no way seek to deny the amount of pain and suffering the Keeran family has endured. But Wood’s jury issued him a death sentence without hearing any mitigating evidence during the sentencing phase, even though such evidence was readily available. The fact that Wood’s jury did not hear this important evidence has not been corrected by the courts, and executive clemency exists to intervene where the courts cannot. I strongly urge you to demonstrate your respect for justice and human life by doing everything in your power to commute the death sentence of Jeffrey Wood. Thank you for your time and attention to this serious matter.